You can use the innovaphone Exchange Calendar Connector application to set the presence of a PBX user according to the Outlook calendar of the user. If the user has e.g. a meeting, the presence will be set to busy and the presence note to the subject of the calendar item (see Presence Note and Activity). The PBX must be V10 or higher. It is needed to use the same version of installed application platform and Exchange Calendar Connector. The innovaphone Exchange Calendar Connector application supports the Microsoft Exchange Server 2010 SP1, SP2 and SP3, 2013 and Office 365! Field experience shows that Microsoft Exchange Server 2016 standalone setups seems to work fine if you select "Exchange 2013" in connector configuration. If you right click on the Windows Authentication entry, you can select "Providers". Make sure, that the NTLM provider is active here! The Anonymous Authentication must be also active, just for the IUSR, not everybody! The Exchange Calendar Connector now also support Basic authentication since v10 sr11. If you disable HTTPS (just needed for debugging) towards the Exchange server, your password will be insecure! This feature was introduced to support Office 365 since it uses Basic authentication and doesn't support NTML Authentication. If your Exchange Server supports Basic authentication, you may have to add your domain to your configured user name, like domain\user. Each Outlook user has to grant read access to the calendar user, which is configured under Exchange in the Account property. Alternative setup will be add the user, which is configured under Exchange in the Account property, to a Group in AD and also include all other users/members that wish to share their calender to this group then you do the step described before but you add the "Group" to each user/member in outlook instead of the calender user used in the "Account" property. You can use the windows taskplaner to shedule a job for the script innovaphone_calendar_rights_starter.cmd to set the correct calendar rights for all users. The script innovaphone_calendar_rights_starter.cmd will trigger the powershell script with the needed environment. PowerShell.exe -command ". 'C:\Program Files\Microsoft\Exchange Server\V15\bin\RemoteExchange.ps1'; Connect-ExchangeServer -auto; .\innovaphone_calendar_rights.ps1"
Note: This is an example and was tested on Exchange Server 2013 (v15). If this is not work anymore or doesn't work for you, then you should configured like recommended above using the Outlook Client. 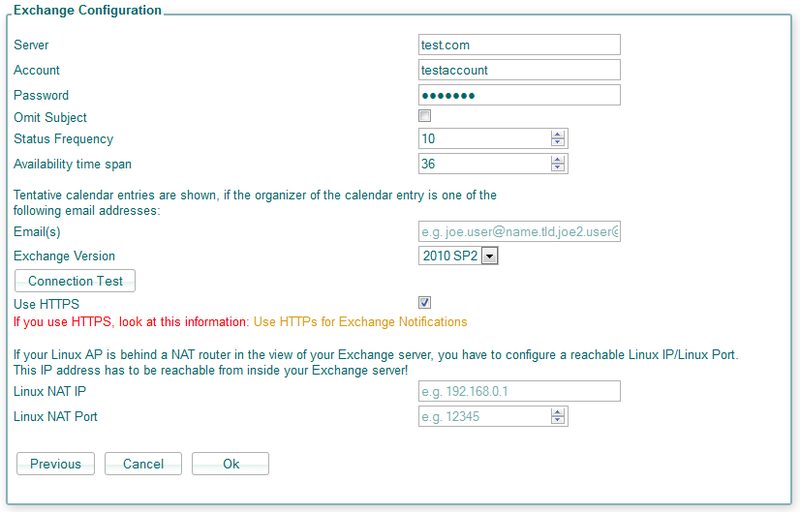 The Exchange Calendar Connector needs the SMTP address of an exchange user. Therefor the E-Mail field of a PBX user object is used and each email address is tried to be resolved to the SMTP address. If your system name of your PBX has the Use as domain option checked, the h323 name is also tried with h323@systemname and this is also done with further configured aliases of the E-Mail field, which have no domain. All three possibilities are successfully resolved, as each email address exists for an Exchange User. A user object with no H323 name will be always ignored! Download the latest version of innovaphone Exchange Calendar Connector. Log into the application platform, go to the Applications tag, click on Upload/Update and upload the downloaded file. The installation will start automatically and the page will refresh every two seconds showing the installation process. If there is no error during the installation you will see at the end "Installation was succesfull". Otherwise, you will get "installation failed" and the reason why it went wrong. If you have already installed the latest version of the exchange application, simply download the Exchange...HotfixIncremental for your platform (VM or IPxx10) or if you have missed some hotfixes, download the Exchange...HotfixCumulative archive, which contains all hotfixes since hotfix1. Upload this hotfix archive here. You can configure multiple PBX/Exchange pairs on one Linux Application Platform. Account: the account, which reads the users from the PBX via SOAP, must have at least the right "Viewer"
Domain Filter: Optionally enter a comma separated list of domains. PBX users without a matching email address are ignored. Account: the exchange user account, which has sufficient access to the user calendars, which shall be monitored (see Outlook for how to grant these permissions). The account also needs to have a mailbox configured inside the Exchange server. Omit Date and Time in presence note: Omits the date and time inside the presence note. Exchange Version: SP1 or SP2 of the Microsoft Exchange Server 2010 or Microsoft Exchange Server 2013. For Microsoft Exchange Server 2010 SP3 please use the setting 2010 SP2. Linux DNS Name (optional): You can optionally set the DNS name of your Linux AP, which will be used by the Exchange server for HTTP requests. Linux NAT Port: If your Linux AP is behind a NAT router in the view of your Exchange server, you have to configure a reachable Linux IP/Linux Port. This IP address has to be reachable from inside your Exchange server! The connection test just tests the SOAP connection towards the Exchange Server. The SOAP connection from the Exchange Server to the Linux AP is not tested! The exchange application creates the innovaphone-exchange database to store users from the PBX. PostgreSQL is also available for other applications and any of them could create its own database. The exchange application creates the database user innovaphone-exchange with default password exchange. This password may be changed at the innovaphone Exchange Calendar Connector page under Config/Database. There are tools (PgAdmin III) that allow to connect to application databases remotely. 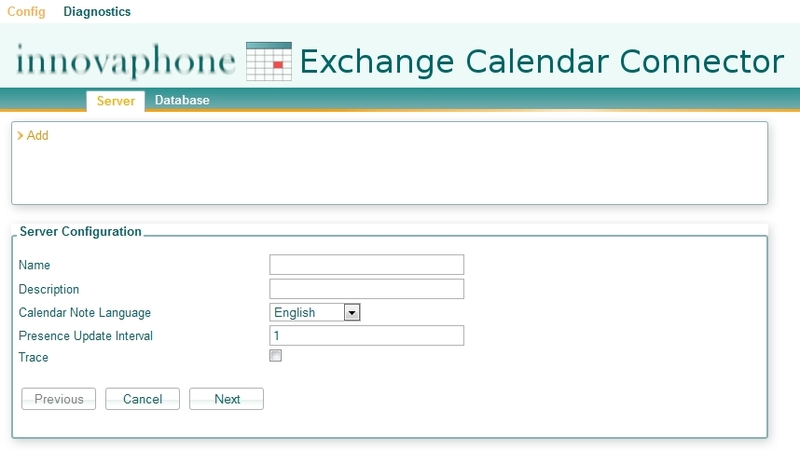 It is first needed to configure the IP you are connecting from under Config/Database at the innovaphone Exchange Calendar Connector page. Download/View logs of the innovaphone Exchange Calendar Connector application. Select either All Servers or a specific server to list users or calendar items. List all monitored users and their current subscription state. List all retrieved calendar items. You can both manually and automatically backup the database and configuration files for the exchange application under Administration/Backup in the application platform. Configuration details for the update server can be found here. saveinnovaphone-exchangecfgs is the command used to automatically save configuration files with the Command File. saveinnovaphone-exchangedb is the command to automatically backup the whole innovaphone Exchange Calendar Connector database with the Command File. As the database contains your server configuration, a backup might be usefull! saveinnovaphone-exchangelogs to save log files with the Command File. After the configured interval, the PBX users are compared to the already existing ones and if needed added/removed/renamed etc. The first time after you have successfully configured the PBX and the Exchange Server, all user subscriptions are established and all calendar items are retrieved. This may take some minutes, according to the user count. The settings of a calendar item determine the presence activity and note. A calendar item is ignored, if its busy type is free or tentative (see Tentative calendar items). The subject of a calendar item is ignored, if the calendar item is private. The activity is only set, if the calendar item has already started! will prefer presences with an activity. If there is no presence with an activity, the note is shown e.g. on the phone/in myPBX. An all-day calendar item is e.g. from 25/05/2013 00:00 until 26/05/2013 00:00 and it's also displayed. A tentative calendar item is neither free nor away, so it is ignored by default. But if the organizer of a calendar item is one of the configurable email addresses, the item is treated as away! For communication with the Microsoft Exchange Server, its Exchange Web Services are used. pg_hba.conf is the client authentication configuration file and controls which hosts are allowed to connect, how clients are authenticated, which PostgreSQL user names they can use and which databases they can access. If you backup the innovaphone Exchange Calendar Connector database, you'll get a gz archiv, which contains the whole innovaphone-exchange database. Users retrieved from the configured PBX. Calendar items for the users retrieved from the Microsoft Exchange Server. NetDrive is a usefull webdav client, which can be used to access webdav of the innovaphone application platform. PGAdmin is an administration tool for PostgreSQL databases. Putty is SSH client to connect to the linux application platform. If you have to use HTTPs for Exchange Notifications, your Linux AP needs to have a signed certificate which contains the IP address of your Linux AP or its dns-name (since V10SR38)! On your Exchange Server, you also have to trust the root certificate of your signed Linux AP-certificate . the Linux AP certificate must be trusted on the Exchange server, by ensuring that the root certificate is installed inside the certificate store "trusted root certification authorities"
the usage of self-singed certificates by the LinuxAP was not tested successfully. We recommend therefore to use a LinuxAP certificate signed by an CA authority trusted by the Exchange server. Pay attention if you have set the Force HTTPs flag on your Linux AP! In this case requests of the Exchange Server are redirected to a HTTPs location and your Linux AP must meet the conditions from above! The Exchange Calendar Connector establishes a subscription for every user with the exchange server. If such a subscription request fails (e.g. calendar permissions are wrong/not set), the next retry is not done until 2 hours later. This has been implemented to reduce the system load for systems with many PBX users, where such a fail is expected. If an administrator now tries to correct user settings, it might last up to 2 hours until the changes take effect. An administrator can still click through the Exchange Calendar Connector configuration to enforce new subscriptions for every user (but this may take much time for the first run). In this case the user object will not get presence from exchange (fixed in #29761 - Calendar Synchronization did not work for PBX Objects with "Hide from LDAP" set). Exchange may limit the number of concurrent subscriptions for calendar updates. This is under control of the EWSMaxSubscriptions policy. We have seen this set to 20 in Exchange365 installations. In this configuration, presence updates will not be done on the fly when changes occur. Instead, a full replication will occur every 10 minutes if Status Frequency is set to 5. To make sure the connector is not overloaded, have a look at the log file in Diagnostics/Logs/innovaphone Exchange Calendar Connector/View. The time in minutes between the log entries date time: ITW ExOn: EWS initialized and date time: ITW ExOn: PBX presence updated must be less than your Status Frequency setting. This fix is available from V10 Service Release 47. 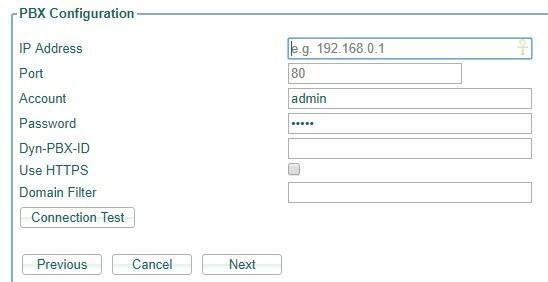 If you use a load balancer in front of multiple Exchange workers, the connector configuration might say "connection works", but no calendar items will be synced. As a workaround you can use an Exchange-Worker-IP directly. Then activate RPCAP on your Linux Application Platform under Diagnostics->RPCAP. Start a Wireshark-Trace for your Linux IP on both interfaces LO and ETHO. Walk through your Exchange Connector configuration, add :80 to your ip address or dns name of your Exchange Server, e.g. 172.16.17.18:80 and commit the changes. Save the wireshark trace after about 10 minutes. 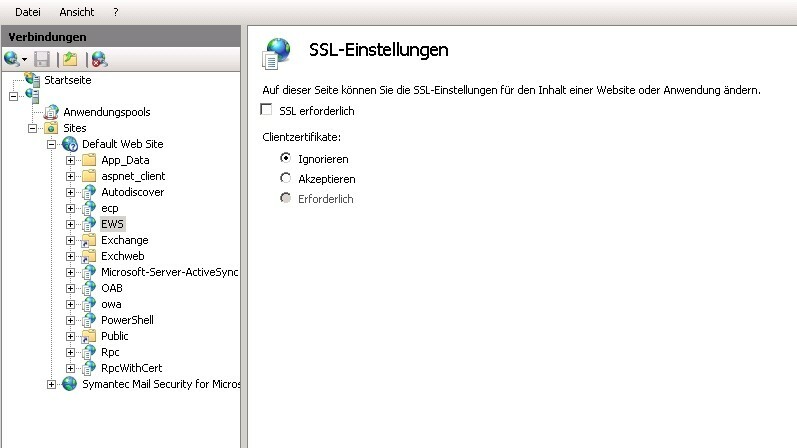 Keep in mind, that with Basic authentication (used with Office 365), your password will be transferred in plain text if you disable SSL!